If you haven't heard of Nuun before now, this might be the first running blog you've ever read. This stuff is everywhere you look on the interwebs! Nuun (pronounced like the noon hour of the day, not like the lady in a habit) is a tube of tablets that you can pop into your water bottle, and the tablets then fizz out electrolytes into your water. No shaking required. The past few weeks I've been testing Nuun out to see if it stacks up to its fanfare. So why are people so over the moon about Nuun (oh, the rhymes)? They were the first company that separated electrolyte replacement from carb replacement. 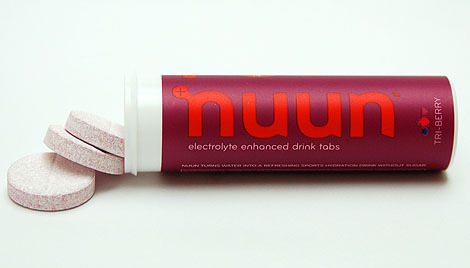 Nuun has electrolytes like you would get in your old pal Gatorade without all the sugars. It does better than less sugar -- it has no sugar. To get the slightly sweet flavor, Nuun's active hydration tablets include sorbitol, a sugar alcohol which is also found naturally in some fruits, and acesulfame potassium, an artificial sweetener. See the label below for the ingredients included in one tablet. Nuun also offers a new product line called U Natural Hydration that doesn't include any artificial sweeteners. Another reason that Nuun is so popular is that it is really convenient. The tube comes with 12 tablets that each can be added to 16 ounces of water. They make the tablets so that you can easily half them if you only want 8 ounces. Over the period of testing, I kept two tubes in my gym bag with barely any added weight and zero inconvenience. I also carried a water bottle that I could fill up once I was at the gym. After you fill up your water bottle, you just drop (the tablet into the water) and go. Below is some Nuun working its fizzy magic in my water bottle. I always opened the water bottle spout when I was letting the Nuun fizz because I was nervous about pressure building up in the bottle. Has anyone ever had a Nuun explosion in their water bottle? I just assumed it would happen but didn't actually want to test that out. And this is where I was thrown off at first. Because everyone adores Nuun, I assumed that I would love it at first sip. Not so much. I tried Lemon Lime first, and I gagged a little. Not the reaction you want to have when you are testing something that you hope will be awesome. It tasted more alka-seltzery than heavenly. But like a lot of things that gagged me at first try (chia seeds and GU, anyone? ), I started to get used to the flavor. Tri-berry was not gaggy at first sip, but maybe by then I was already used to the fizzy, electrolyte-ness of it from trying Lemon+Lime first. But after a couple of bottles of each flavor, I actually started to enjoy the fresh fizz (which goes away if you wait a long time before drinking it) and light flavors. They have tons of flavors to try, but of the two I tested, Tri-Berry was my favorite. Nuun is for you if you don't want to get your calories and sugars from a drink but you want to make sure you are replacing the electrolytes your body uses during your sweaty workout sessions. It has less than 8 calories per tablet and no sugars. I liked using it during my shorter weekday runs, where I'd still like to replace some electrolytes lost but without adding extra calories that I don't need for my workout. Also, it would be great to use if you prefer not to use Gatorade, GUs, Honey Stingers or Shot Bloks on your long runs. So if you're into fueling with Sour Patch Kids or PB&Js, this would be an excellent means of rounding out your electrolyte intake without eating electrolyte-enhanced foods. It is comparable to GU Brew, which uses sorbitol, fructose and stevia leaf extract for sweeteners and has 10 calories per serving. Nuun is less expensive at $6/12-tablet tube versus GU's $6.50/12-tablet tube. Also, if you purchase eight tubes or more, Nuun's price goes down to $5.50/tube. Would you like to try some Nuun or (more likely) add to your Nuun stash? Nuun sent me an extra tube of Tri-Berry and Lemon+Lime so I could share them with one of you awesome readers. In the comments of this post, tell me why you need some Nuun right now. 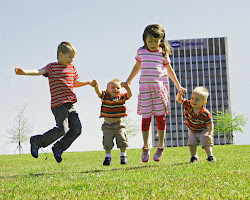 * Follow (or already follow) Yo Momma Runs via Google Friend Connect. Leave a comment telling me you do. * Follow Nuun on Twitter. Leave a comment telling me you do. * Like Nuun on Facebook. Leave a comment telling me you do. I'll pick a winner on Friday, August 24th. Nuun sent me two tubes of Nuun to try and two tubes to share with Yo Momma readers. I received no payment for my review, and as always the thoughts and opinions are all my own. I'm training for 2 marathons and need Nuun to help me stay hydrated!!! I need Nuun because I am bored and a Nuun experiment explosion could cure that boredom...just kidding. I want to try it because I hate all the sugar and extra calories that Gatorade puts in me, but love electrolytes. I am running a 1/2 marathon in September and Chicago Marathon in October. Last year at marathon time it got hot...I mean killer hot for October. I can't stand how sticky sweet gatorade is, it upsets my tummy when I run. I use to drink GU but since I tried NUUN tropical I am hooked. I need nuun because I am obsessed with it and can never have enough. I need some nuun for my daily runs in the am, great rehydration! I am in desperate need of NUUN!!! Only 2 stores near me sell it, and can you believe this weeekend one sold out??? I now "like" you on FB! I follow Nuun on Twitter. I need some NUUN to deal with all this hot weather running! Started following you on Twitter. I like Nuun on FB! I need some Nuun right now because my tap water tastes like chlorine, even when I filter it. Nuun would help me mask the chemicals. I need me some Nuun! I'm dying to try it out! I need some Nuun to train for my first marathon ! I like to try new things. Nuun, I have yet to try. I need some nuun right now BC I haven't tied the two flavours your giving away! And I follow you on twitter to! I need some because my own stock is way low! The strawberry lemonade one is SO good! oh, and the fruit punch too! follow you on the twitter spot! i like Nuun on the book! umm, i told my husband that you can't just EAT IT. and he did. because i said he couldn't. anyway, now i need more, and i live in the middle of no where, they don't sell it very close to me!! I'm so torn in Nuun. Everyone I read loves the stuff, I don't like it!!! Thanks for the honest review. Interesting you got used to it. Maybe I should try Tri berry because I generally love berry stuff!! So here's my entry, to try again!!!! And I already follow you on twitter too. Stalker!!! I need Nuun because I ran out last fall and have been too cheap...errr...busy to purchase more. I have just been gagging as I finish off all the other hydration powders/tablets I have tried and not liked in the past. Nuun is an excellent product that I purchase from Rush Running! I have had my water bottle caps shoot off before LOL. Now I leave the cap off. Lesson learned. I like Nuun on Facebook! I've heard a lot about noun! Thinking I need to give it a try as I train for my second half Mary this fall. Gatorade and gels are too sweet for my sensitive tummy...nuun may be the answer! I am a Nuun FB fan! I am yo momma fan, too! I need Nuun because I need electrolytes. Getting ready to do warrior dash so would love this. I follow nuun on twitter. Love lemon/lime. Would love to try tri berry. I have that komen/pink lemonade flavor and it's ok, but I'm not all about the politics, so won't buy that flavor again. Very amazing? product, without any doubt this works..
Also- I recently purchased and tried Kona cola and Lemon tea Nuun. my taste buds are not happy with Nuun and my poor choices. Definitely sticking with strawberry lemonade or fruitier flavors! I follow your blog! Mmmmhmmmm I do!